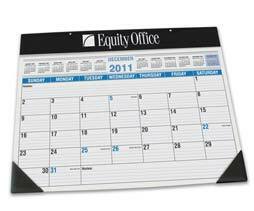 Personalized Desk Planners - Calendar Pads Custom Printed in Bulk. Promotional, Very Inexpensive, with Vinyl Top and Corners. Budget Prices in America. Large 22" x 17". High quality, yet inexpensive Vinyl Desk Planners in bulk, customized with you logo. Large size: 22" x 17". Free artwork design and Free proofs! American clients pay no taxes. The unit prices below include your 1-color custom imprint on the black vinyl top (see photo). Multi-color imprint is not available. PRODUCTION TIME: 5-7 days after art approval; Free Rush 3 day production: contact us. Optional Charges: Holes Drilled: $0.30 ea. Packaging: Individual polybags; 25 pieces/carton, 34 lbs. Please check also our personalized desk calendars with your custom imprint on paper.